To Cite: Hashemian S S, Noroozi A, Massah O, Radfar S R, Daneshmand R, et al. Integration of Outpatient Alcohol Treatment in Drug Use Disorder Treatment Centers in Iran: Study Protocol, Iran J Psychiatry Behav Sci. 2017 ; 11(2):e8398. doi: 10.5812/ijpbs-8398. Background: Alcohol use is a health concern in Iran, the most populated Persian Gulf country. However, alcohol use disorder treatment is a new issue in Iran, which needs consideration. Objectives: In this article, we present a study protocol that aims to investigate the feasibility and effectiveness of integration of outpatient alcohol use disorder treatment in drug treatment centers in Iran. Methods: The study design is a prospective cohort and multi-center research, which will be conducted in major cities of Iran in 2016 - 2017. Overall, 750 participants with psychiatric diagnosis of hazardous alcohol drinking or dependence will be recruited. The settings will be 150 outpatient drug treatment centers. This project will be implemented in 3 phases. Phase I will be the preparation phase, Phase II will focus on training treatment providers and Phase III will be the main phase of the study and will evaluate the feasibility and effectiveness of integration of alcohol use disorder treatment services within outpatient network of drug treatment centers. Five questionnaires will be used to assess the study outcomes. Completing the study questionnaires at baseline, weeks 4, 12, 24, and 52 will assess participants. Data analyses, including descriptive statistics, regression models, and repeated measures of ANOVA will be performed using SPSS version 22. Conclusions: This is the first study to investigate the feasibility and effectiveness of integration of outpatient alcohol use disorder treatment in drug treatment centers in Iran. If found effective, the results of this study will be useful for applying in Iran and other countries in Western and Central Asia. In Persia (modern-day Iran), alcohol and wine production goes back almost 7,000 years; In excavations at Godin Tepe site in the Zagros mountains, traces of wine and beer have been found in pottery vessels dated c. 3100–2900. Even earlier evidence was found at Hajji Firuz Tepe village (1). Alcohol use is the sixth leading contributor to morbidity and premature death in the world (2). For disability–adjusted life years (DALYs) lost, alcohol use is placed in the third position globally (3). More than 200 health conditions reported by ICD-10 disease and injury codes are due to alcohol use (4). A recent world health organization (WHO) report showed a stable trend of alcohol use in Western Asia, including Iran, during the last 5 years (4). A national survey reported the current prevalence of alcohol use and dependence among 15 to 64 year old population were between 0.3% and 0.6% (5). In response to recent epidemics of poisoning due to use of adulterated alcohol in some cities of Iran (6), a nationwide policy of “prevention, supply reduction, treatment, harm reduction, and rehabilitation of alcohol use, 2013 - 2017” was prepared by the ministry of interior and the ministry of health and medical education (MoHME) in 2013 (7). According to this nationwide policy, MoHME is committed to provide standard outpatient and inpatient alcohol use disorder treatment programs for alcohol-dependent patients. This is in line with the global alcohol policy to reduce harmful use of alcohol and emphasizes the central role of health services in order to minimize alcohol-related harms (8). MoHME launched outpatient treatment centers for opioid dependence with opioid agonist medications in 2002 (9). These centers were scaled up rapidly. Currently, there are more than 6,500 such professional centers providing medical and psychological services to more than 800,000 opioid-dependent clients. In order to implement a nationwide outpatient alcohol use disorder treatment program, it was decided to pilot integration of alcohol use disorder treatment services into a selected number of these centers (7). The substance abuse and dependence research center (SADRC) and the University of social welfare and rehabilitation Sciences (USWR) designed a pilot project, which was supported by the Substance abuse prevention and treatment office (SAPTO) and MoHME. In this study, we aim to investigate the feasibility of integration of outpatient alcohol use disorder treatment in drug treatment centers in Iran. If found feasible, the results will be useful to apply in Iran and other countries in Western Asia. This prospective cohort research is a multi-center study of the integration of outpatient treatment for harmful drinking and/or alcohol dependence in outpatient drug use treatment centers in all major cities of Iran. In this protocol, we will evaluate the feasibility of combining harmful alcohol use treatment with treatments for abuse of other types of substances. We will also provide an estimate of client’s reception of, and retention in the program. Additionally, in the population under the study, we will evaluate high-risk behavior, psychological health status, and use of other substances as other primary outcomes. Study sites (i.e. 150 outpatient drug treatment centers) have been selected and service providers have been trained. Overall, 50% of the study sites will be selected from Tehran and the remaining 50% will be selected from 37 cities. These centers will be randomly selected from different socioeconomic areas. If necessary, other study sites will be selected among eligible volunteer centers based on the prevalence of alcohol use in the provinces reported in national estimate of alcohol and drug use in Iran, 2012 (10). OPEN-Epi software will be used to calculate the sample size. It is estimated that 750 participants are needed and will be recruited based on the inclusion criteria. Inclusion criteria includes: (1) age of at least 18 years, (2) current alcohol drinking assessed by alcohol use disorder identification test (AUDIT) (11), harmful alcohol use or alcohol dependence syndrome according to ICD-10 (12) and (3) providing written informed consent. Exclusion criteria includes: (1) self-reported severe medical and psychiatric problems, (2) severe alcohol dependence defined as a score of greater than 30 in severity of dependence questionnaire (SADQ), (3) history of seizure or delirium tremens in their previous alcohol withdrawal attempts. Patients who have concurrent alcohol involvement with opioid and/or methamphetamine use disorders will be included in the study, if they meet the eligibility criteria of the study. Alcohol breath analyzer and biochemistry tests will be used. Participation in the study and revocation of consent will be voluntary and confidential. The study protocol has been approved by the USWR Ethics Committee in Tehran, Iran. The ethics approval code is IR.USWR.REC.1395,136. Participants will be assessed at baseline, weeks 4, 12, 24, and 52. Screening will include the alcohol use disorder identification test (AUDIT), section J of composite international diagnostic interview (CIDI) on disorders resulting from the use of alcohol (F10), and a checklist of eligibility criteria for study participation. The following questionnaires will be used (See Table 1). Abbreviations: BL, Baseline; WK4, Week 4; WK12, Week 12; WK24, Week 24; WK52, Week 52.
aOnly for home-based detoxification group. bEvery day during first 5 - 10 days of assisted withdrawal. cDuring all planned and unplanned visits and before each psychological session. The AUDIT questionnaire is designed to identify people who have an alcohol-use disorder (11). AUDIT could identify 5 levels of alcohol use involvement including abstinence, low-risk drinking, hazardous drinking, harmful use of alcohol, and dependence among adults (12). The Persian version of this tool has showed high reliability and validity (13). Clinical institute withdrawal assessment for alcohol scale, revised, (CIWA-Ar) is an 8-item clinical assessment which could reliably be used to guide clinical decisions during medically-assisted alcohol withdrawal (14). The addiction severity index, lite version, (ASI-Lite) is a semi-structured outcome assessment covering multiple dimensions (15). The Persian version of this questionnaire has high reliability and validity (16). The mini-mental status examination (MMSE) is a 30-point questionnaire. It could be used in clinical and research settings to measure cognitive impairment (17). The MMSE in Persian has been validated (18). WHO-QoL-BREF consists of 26 items with a focus on 4 domains including physical health, psychological health, social relationships, and environment. This version of the instrument is the short version and may be more convenient for use in large research studies (19). Furthermore, its reliability and validity in the Persian version have been approved (20). (12) changes in biomarker indicators as presented in Table 1. Data will be analyzed using the SPSS version 22.0. Descriptive statistics will be performed for baseline data. Regression models and Repeated Measures of ANOVA will be performed for assessing the primary and secondary outcome measures. The study will be conducted through 2016 - 2017. This project will be implemented in 3 phases as below. Phase I: the preparation phase. In this phase, study sites and treatment providers will be selected and consent forms will be obtained. We will prepare training modules for treatment providers based on 2 national guidelines developed in other projects (21). Participant screening and recruitment will be completed at all centers on January 2017. Patient enrollment and data collection are expected to be completed by the end of 2017. In Phase I, treatment providers (medical doctors and psychologists) should have the following criteria for inclusion: (1) more than 2 years of treatment work experience with patients with drug use problem, (2) have acquired 20 continuous medical education (CME) points annually for medical professionals in the field of addiction during the last 5 years, and (3) for psychologists who have passed at least 2 related courses including a training course on psychosocial interventions. In phase I, study sites will receive a certification on “outpatient alcohol use disorder treatment unit” from the MoHME, which will be valid for 1 year. This will allow them to advertise their treatment services. This provisional license will be extended for another 2 years for each center that provides services to at least 5 patients and properly collaborates with the pilot project. MoHME will coordinate with emergency wards, particularly clinical toxicology units of medical universities and the National Addiction Hotline of the Iran’s social welfare and rehabilitation organization in order to refer clients in need of alcohol use disorder treatment services to the selected study sites in each province. Phase II: this phase will focus on training treatment providers. They will receive training during 5 workshops. Training course will consist of 32 hours of theoretical and practical sessions covering a list of topics including screening and assessment, care planning, assisted-withdrawal regimens, psychological interventions, documentation, and reporting. Study questionnaires and data gathering will be explained in the last day of workshop; clinics’ psychologists will be invited to participate in the workshop on that day. Phase III: this phase will be the main phase of the study, which tests feasibility and effectiveness of the integration of alcohol use disorder treatment services within outpatient network of drug use treatment centers. In this phase, patients with problematic alcohol use will be assessed at treatment centers using physical examination and structured questionnaires in order to determine their level of involvement with alcohol. 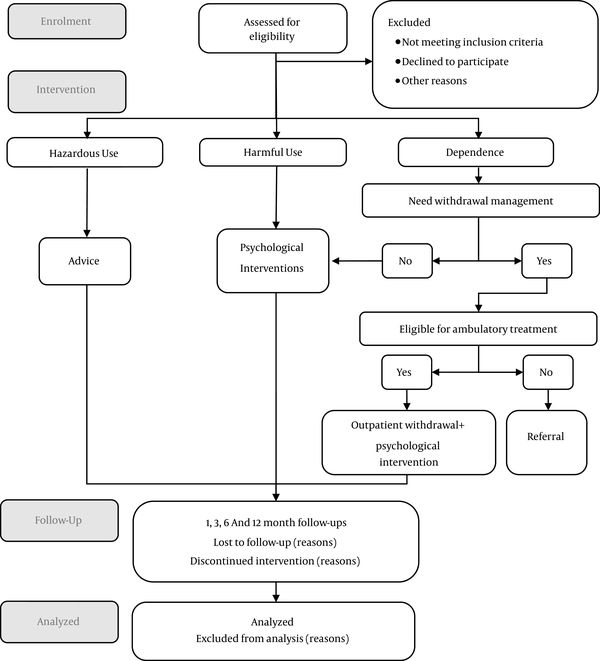 Recruitment process, interventions, and follow-up are presented in Figure 1. After conducting initial evaluations and identifying clients in need of intervention, based on their needs, they will be referred to in-patient or out-patient treatment centers. Out-patient treatment will be planned according to the severity of the patient’s dependence and harm, and will include brief interventions and/or withdrawal management. Brief interventions include providing information and recommendations in order to reduced hazardous alcohol use and/or alcohol related problems. Alcohol withdrawal management includes medical and psychological therapy and will be planned based on the severity of signs and symptoms, which can be measured using the clinical institute withdrawal assessment for alcohol, revised (CIWA-Ar), alcohol withdrawal scale (AWS), and short alcohol withdrawal scale (SAWS). Medications used for alcohol withdrawal management are mainly benzodiazepines, anti-epileptic s, anti-psychotics, and other as-needed medications for symptomatic relief. Three medications are planned to be used for relapse prevention; naltrexone, acamprosate, and disulfiram. The following manuals will be provided to all investigators: evaluation, screening and brief interventions, medical treatment guideline, and psychological interventions guidelines. To ensure the fidelity of the assessment, several procedures are employed. All treatment providers will receive training to deliver interventions based on the approved national guidelines. Two staff members from each study sites will participate in training programs. Local supervisors will be recruited from experienced staff members at drug treatment supervision departments in the medical universities’ deputy for treatment affairs. Each university supervisor will be primarily in charge of the affiliated centers in order to maximize the feasibility and acceptability of the community-based alcohol services in those centers. In the event of a problem, the problem should be documented and sent to the project team in order to discuss and find mutually agreeable solutions as well as to share these experiences with other local supervisors. Supervisors will also be responsible for providing field visits to alcohol use disorder treatment units before certification approval and during the study period to check fidelity of recruitment processes, service delivery, and documentation. Data will be collected by the physicians and clinical psychologists at the study sites based on the study protocol and will be directly entered into the study computer database. Data quality and completeness will be continuously monitored by a study team member at each study site. This study protocol describes the design of the first community-based alcohol use disorder treatment program in Iran. As the first study from Western Asia, especially the Persian Gulf region, it aims to investigate the efficacy of integrating alcohol use disorder treatment within the network of outpatient drug treatment centers. The study identifies 3 groups of alcohol users including hazardous drinkers, harmful drinkers, and alcohol dependents as well as provides them with appropriate treatment services, ranging from simple advice to ambulatory assisted withdrawal. In the present study, we will train treatment providers and then examine the effect of training on their knowledge as well as their self-efficacy to provide alcohol services, completely new for Iran. We will test the feasibility of providing ambulatory alcohol use disorder treatment services in terms of successful recruitment and treatment engagement and its effectiveness on alcohol use and other study outcomes. This study will provide valuable data, and since the study sites have a nationwide distribution, it will provide new insights into the extent of alcohol use disorder treatment demand and effectiveness of a community-based response within different socio-cultural backgrounds. If the model offered is successful, the study will demonstrate that a community-based alcohol use disorder treatment is feasible to implement and effective for alcohol use disorder treatment in Iran. In addition, as the design is based on the integration of the services, it will suggest a useful model for health policy makers to employ the current network of opioid treatment centers in order to provide proper response to new challenges. Study limitation: Alcohol use in Iran is taboo, which may prevent those in need of treatment to come to the clinics. Procurement status of specific drug for the treatment is unknown at this time (it is supposed to resolve the issue) and software that will be used for the study may not be streamlined (in this case, data will be recorded on paper). We would like to thank our research team. Authors’ Contribution: All authors contributed to the literature review and study design. Seyed Sepehr Hashemian drafted the manuscript and other colleagues edited it under the supervision of Karl Mann, Alireza Noroozi, and Ali Farhoudian. Funding/Support: This work was supported by the Substance Abuse Prevention and Treatment Office (SAPTO), Ministry of Health and Medical Education (MoHME).